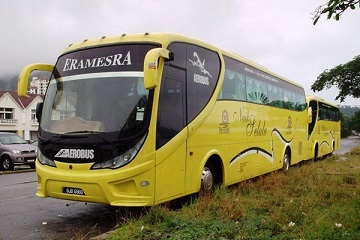 Era Mesra is an operator hailing from Parit Buntar with over 5 years experience in the industry. Currently, Era Mesra is 15 fleets strong, paving the way for new routes as well. Among them include destinations such as Seremban, Shah Alam, Melaka and Klang. They operate at numerous accessible bus terminals. Terminal Bersepadu Selatan, Hentian Duta and Shah Alam terminal are just a few major terminals to mention. Their buses consist of refurbished second-hand buses with new fittings, offering a comfortable travel experience and overall, an optimum level of service for their customers. Address : Kaunter 2, Klang Sentral, 41050 Klang, Selangor. Address : Counter 11, Seksyen 17 Bus Terminal, Shah Alam. CatchThatBus offers online bus tickets to many routes covered by Era Mesra as well as seat availability features. You can book your bus ticket online from our website or via mobile app which can be downloaded for free on Google Play or App Store.